A customer service revolution is occurring in financial services. It’s dynamic, overarching, and being driven by consumers who are embracing digital and mobile channels as never before. The digital age is changing the way consumers research, shop and buy products and services and how they share their experiences after purchase. As a result of this transformation, there has never been a time when customer service and the overarching customer experience has been as important as it is today. The rise of digital channels, digital communication, social media, social networks and word-of-mouth across a connected universe gives us a glimpse into the power and potential to solve problems, address complaints proactively, and potentially predict outcomes before they occur. In financial services, we have seen the power of these new channels allow the masses to attack the largest organizations in our industry and make them change policies or adjust procedures. On a singular level, consumers have more ways than ever to voice their displeasure. The key is to create an organization that can leverage digital technology to be responsive (or maybe proactive), empathetic, accessible, connected and human in the hearts, minds, and wallets of your most prized assets – your customers and your employees. But, customer service is just one component of a much broader customer experience imperative that you can leverage to create a superior digital customer relationship. 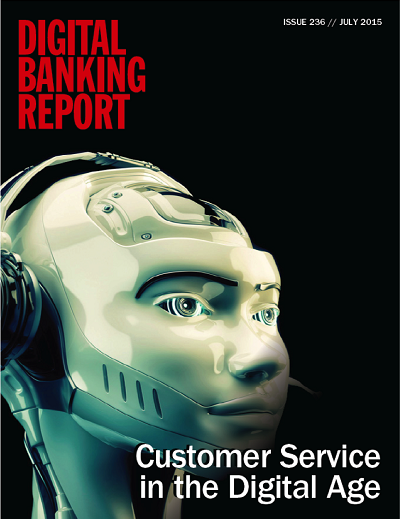 The 57-page Digital Banking Report, ‘Customer Service in the Digital Age‘ provides a guide to providing the best level of customer care in today’s world of online banking, mobile devices and social media. Written in conjunction with Jeanne Capachin, this report provides strategies and tactical advice to help move organizations to a new level of customer service. A customer service revolution is occurring in financial services. It’s dynamic, overarching, and being driven by consumers who are embracing digital and mobile channels as never before.